The weather gods could not make their mind up today and we awoke to an overcast but dry day – a real bonus for our start to the walk. Neither of us slept particularly well, probably due to both apprehension and excitement. We must have been in a rush to get going as we heard Rachel, Nick’s wife exclaim from the kitchen “have they eaten that already” when Nick took our clean “Full English” breakfast plates away! We made a decision early on in our planning to use a baggage transfer company and we are certainly glad we chose Packhorse. Their organisation and knowledge of the route was excellent and our entire experience from start to finish was seamless. We made the short 2 minute drive to Pennine View Camp Site where we would drop off our car and catch the Packhorse transport to St Bees. The process here is to drop off your keys with Pennine View who then move your vehicle to a secure compound about 100 yards away. Therefore if you intend to leave some kit in your car to swap over when you next arrive in Kirkby Stephen, you must ensure you arrive by 1930 as the Camp Site office closes at this time. Pennine View was already a throng of Coast to Coasters when we arrived at 0800. Cyclists, people only doing half, some with massive bags and some with hardly any gear at all. 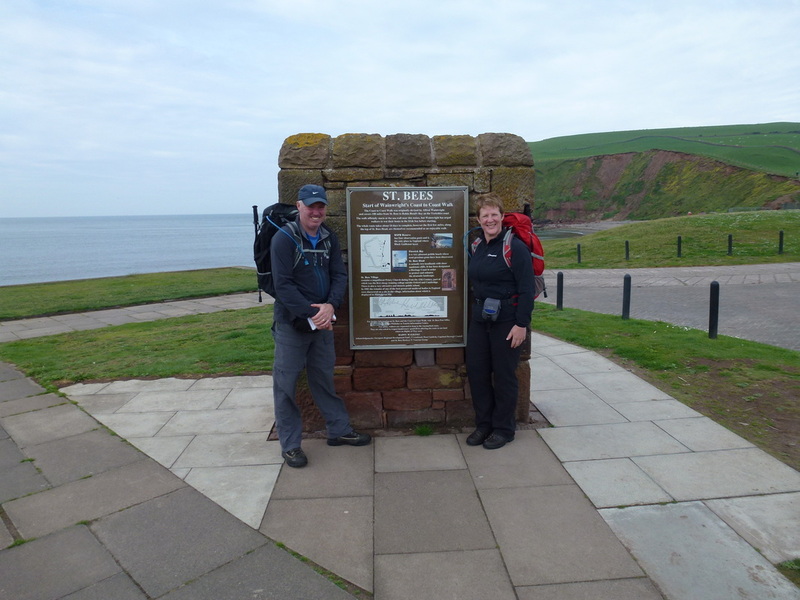 We handed over our baggage and set off for St Bees. Accompanying us on our bus were Stephen and Tracy from Evesham plus their Border Terrier Tess (more about them and the dog later), Philippa and David who were making their 5th crossing and who we would bump into off and on for the first 3 days as well as 4 C2C cyclists. The journey was uneventful and took about 1hr 20min. 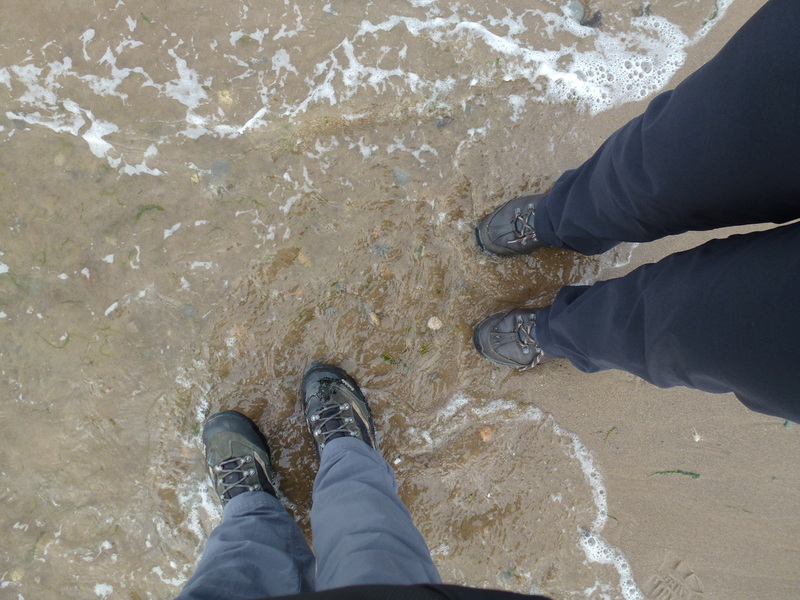 On arrival in St Bees we wished our fellow travellers all the best and then had our photograph taken at the start sign, picked up our pebbles and dipped our boots in the Irish Sea – we were ready! Therefore at 1015 our crossing of the breadth of England, entirely on foot had begun. The weather at the start was overcast but we were hopeful of sunny spells later in the day. 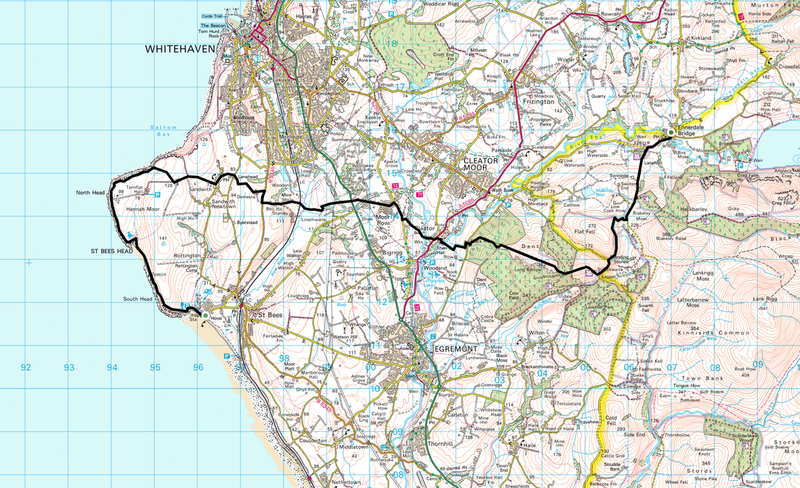 The first 3 or so miles of the walk are in a northerly direction and you do not head east until you pass St Bees Lighthouse at Birkhams Quarry. However, the journey along the coast is superb with lots of twitchers about and also Fleswick Bay is a delightful spot. At the quarry the sun came out and the temperature rose therefore it was off coats and on with sun cream and sunglasses. Our next stop at around 1230 was at the village of Sandwith (pronounced “Sannith”). It was here we first came across Steve and his 14 year old son Jordan from Buxton. They had been behind us since the quarry and passed us at the Dog & Partridge pub which unfortunately was shut. 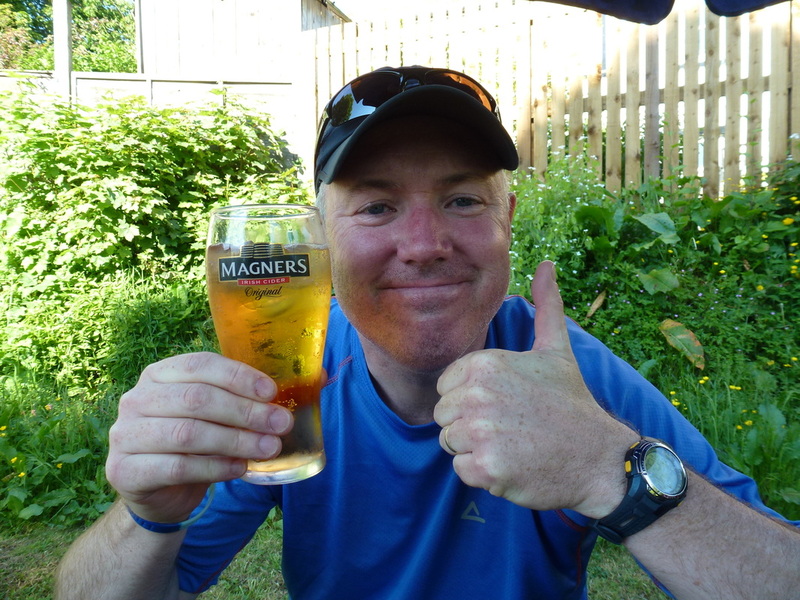 We later found out that Steve and Jordan had completed the C2C last year with full packs and were therefore taking it easier this year staying in B&Bs although intended to go high through the Lakes. 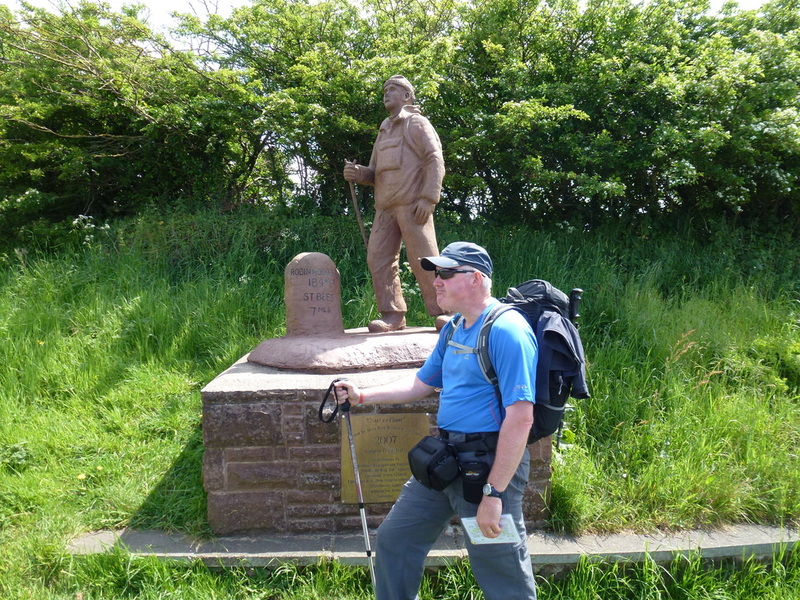 Passing through Moor Row and the C2C statue, at 1400 we reached Wainwright Passage at the Cricket Ground in Cleator which was a convenient stop for lunch. This spot gives a lovely view of Dent Fell, the next objective and the first real climb of the walk. It was whilst preparing for lunch that we first came across a rather posh, well mannered chap who kindly offered us his seat, however we declined his offer as the boundary rope was a nice spot. Lunch over we made our way through Cleator and passed the shop which still had no pies! 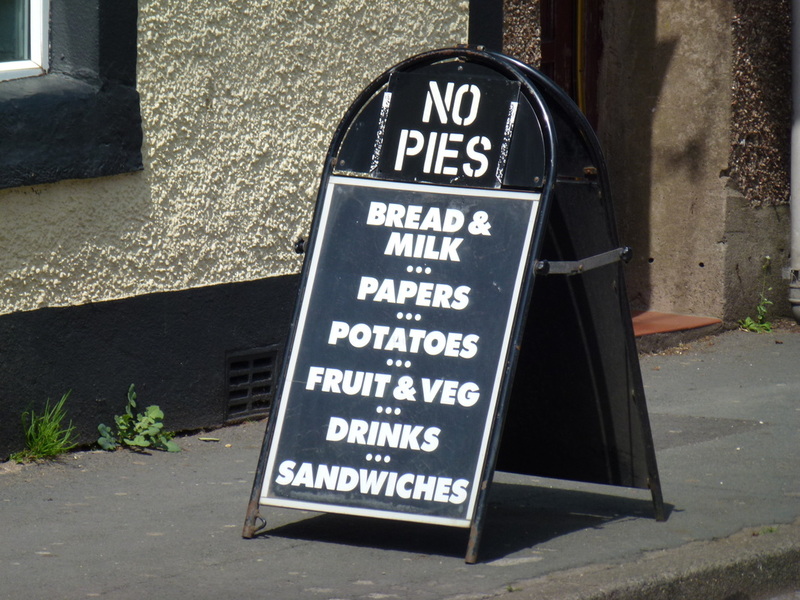 We have read many journals and in some of them there is a photo, similar to the one below announcing no pies – are the pies that good that they run out really early? What is in the pies? Why don’t they make more during the season for hungry C2C folk?? Who ate all the pies? At this point we were joined by the posh chap from the Cricket Ground who we started chatting to and he informed us “he was doing the C2C on a whim” and was making it up as he went along. A really pleasant chap, we immediately christened him “Tim nice but dim” for want of any other name. More of Tim later. Once past Cleator, we started our ascent of Dent (345m, 1132ft). Dent is a good test for the calf muscles and is gradual in its ascent – it was starting to get quite warm therefore we were glad of this easy transit up the fell. Having passed us in Cleator we noticed that “Tim nice but dim” was now behind us – what had he been doing in the woods prior to climbing Dent – eating all the Cleator pies perhaps? Near the top we came across a lovely couple who were also completing the C2C. Billy and Eileen from Lowestoft were in their mid 60s and we were to see quite a bit of them over the next 4 days. 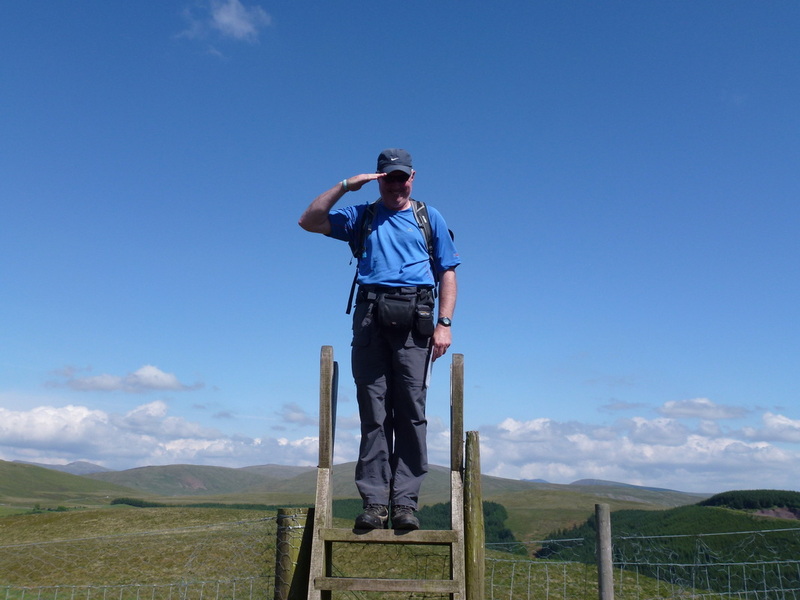 Once at the summit of Dent you gain a superb view over Ennerdale Water and the Lake District fells. Leaving the summit, we made our way over an absolutely huge stile (picture below) and then down to the beautiful Nannycatch valley. This is an unrelenting descent which is very hard on the knees but once down the valley floor is idyllic. The remainder of the journey into Ennerdale Bridge is on a roadside path thankfully as the road was very busy with fast flowing traffic. Apparently the road is a rabbit run from Sellafield and is quite hectic at clocking off time. On reaching Ennerdale Bridge at just after 1700 we took a seat in the garden of The Fox & Hounds and enjoyed a lovely cool pint of Magners while waiting for our transport to The Stork Hotel in Rowrah. Paul from The Stork arrived at 1745 and along with Billy & Eileen who had just arrived, we were transported to our digs for the night. 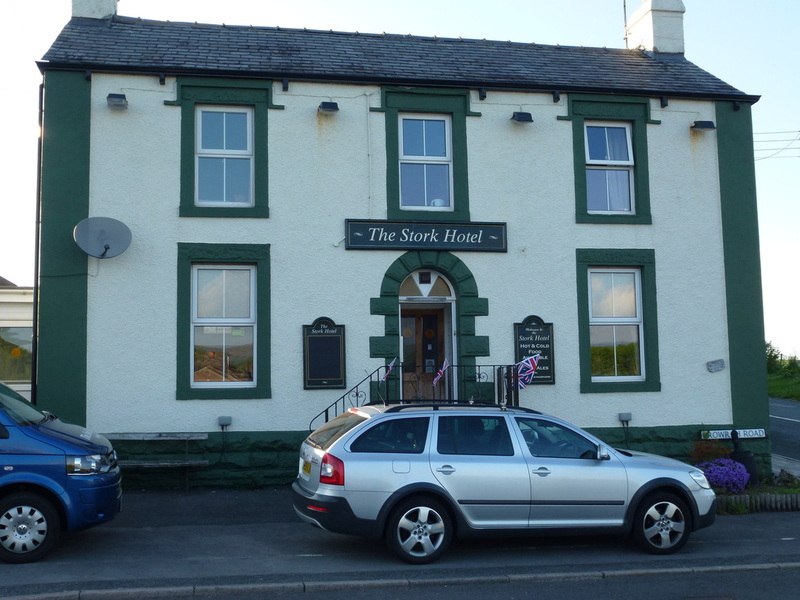 The Stork Hotel is a really nice place to stay as they are well used to people undertaking the C2C. Whilst it is a couple of miles off route, Paul and Joan provide a complimentary pick up and drop off service at a time convenient to you. Our bags were already in our comfortable room and after a decent shower we made our way to the bar where Dave tested out the Black Sheep ale which was excellent. The food was also very good and we were joined by Billy and Eileen and Steve and Jordan who were also staying at The Stork. This has been a super start to the walk and already we have met some really friendly people who we hope to see more of over the next few days. 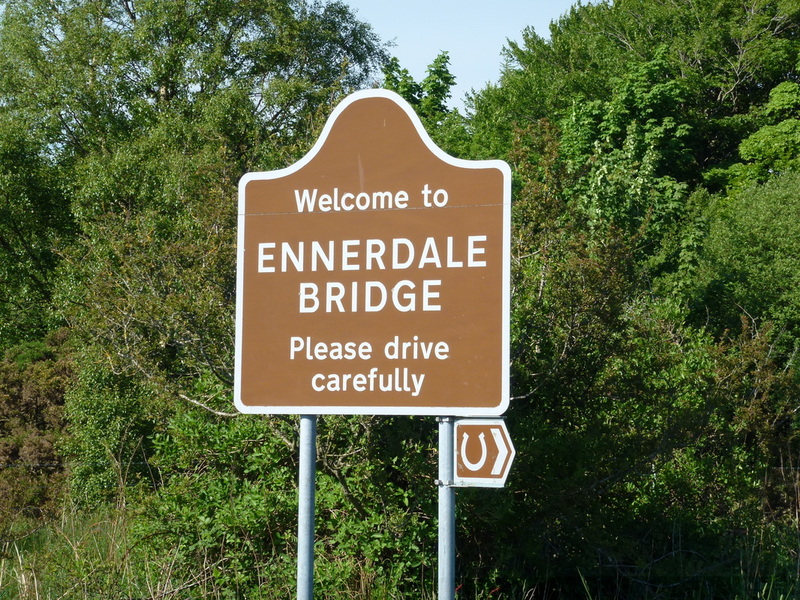 Basic yet very comfortable and they provide a reliable pick up/drop off service from Ennerdale Bridge. Breakfast was very good as was the evening meal. Good selection of beers and real ales.